When we think about a device that can spruce-up, sanitize and freshen up your clothes, sheets or upholstery. 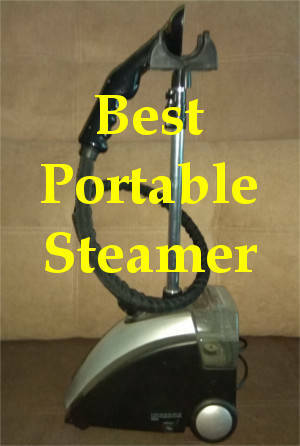 A best portable steamer is the first thing that comes to mind. Many homeowners have already appreciated the magic that steam can do to their homes. With the help of the steam pressure, such machines can combat pests, germs, and mildew. Remove grime from various surfaces, eliminate wrinkles and wipe away bad odor. Needless to say, a portable steamer is an irreplaceable household helper. How do you use a steamer? The main principle of operation is common for all steamers. Start with filling the tank with clean water (preferably distilled) and then turn the device on (not vice versa). Once it starts steaming you are good to go. Slowly but steadily navigate a steam head around the surface making sure each spot receives proper treatment and does not get oversaturated. Once you are done, you should let the device cool down, pour the remaining water out and let the tank dry before putting a steamer away. It is simple and enjoyable! There are several types of portable steamers, each of which is designed for specific jobs. There are steamers for carpets and upholstery, garment steamers, steamers for hard surfaces, and so on. Some of them can serve several purposes, while others are designed only for a specific task. For instance, the better upholstery steam cleaner will not always be appropriate for de-wrinkling garments, while good portable steamer will perform poorly as a sanitizer. See the cool selection. Buyer’s Guide: How to Find Portable Steamers. What is Clothes Steamer to Buy? In our review, we are going to discuss several types of products. Whether you are looking for portable clothes steamer for a wedding dress, a travel clothes steamer or a bathroom steam cleaner, this guide can help you make the right decision. 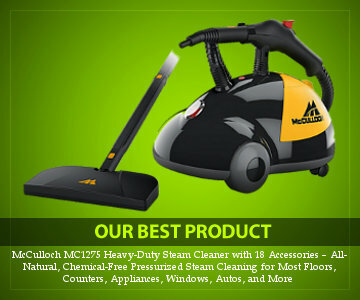 This is a heavy-duty steamer, designed for effective cleaning of various temperature-resistant hard surfaces. The list of recommended applications includes, but is not limited to tiles, laminate, sealed wood, granite, stone, metal grills, concrete, kitchen and bathroom appliances, inside a car, a boat or an RV. However, this machine is not suitable for textiles, carpets, and upholstery. The main advantage of this steaming machine is versatility. It is supplied with 18 accessories, designed for a broad array of cleaning tasks. The floor head attachment with replaceable microfiber mops facilitates spotless cleaning and sanitation of bathroom and kitchen floors. Versatile brushes are perfect for degreasing grills, ovens, and other fixtures. A triangle brush makes steaming in corners a breeze, while a jet nozzle penetrates into hard-to-reach places and removes even the most stubborn stains. The manufacturer has also taken care of user convenience by adding a measuring cup, a water funnel, a carrying handle, and an extension wand. The set of accessories also includes a squeegee for streak-free cleaning of smooth surfaces. This machine is not only versatile but also highly productive. With an over 15-foot cord, it gets rather manageable, while a 108-inch hose provides an easy reach to all corners and nooks of your house, garage, or vehicle. This versatile portable steamer can combat even the toughest stains, aged dirt, grime, and mold from different surfaces. Continuous steaming is enabled to reduce pressure on a wrist and fingers. Easily adjusts to various cleaning tasks. A capacious water reservoir enables continuous cleaning with fewer interruptions. Provides chemicals-free sanitation of bathroom facilities and kitchen appliances. Maneuverable and easy to navigate. Includes a wide steam head for large-area cleaning. Lacks dedicated attachments for carpets, textiles and upholstery. Takes a while to heat up. 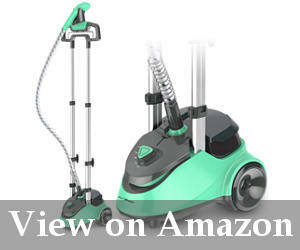 This is a multi-functional steamer that can easily handle the most challenging cleaning jobs. 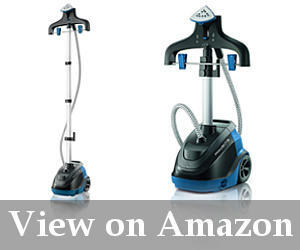 It is built to clean primarily hard surfaces, such as ceramic tiles, grills, kitchen and bathroom fixtures, grouts, etc. Even though there are no dedicated attachments for textiles, some people still manage to use it to fight pests and remove stains from upholstery. Its maneuverability, versatility, compactness, and simplicity of use make it a great household helper. Steamer or iron: which one is better? The answer is obvious to many people. Sometimes ironing can be too stressful and tiresome in contrast to steaming. Vertical steaming does not require a dedicated space; it can be done almost anywhere, where a compact steamer base would fit. This is a fast and effective solution for freshening up wrinkled curtains, sheets, table linen, long gowns or garments with complicated details. PurSteam portable steamer surely can make garment care stress-free and enjoyable. It consists of a steam generating unit, a steaming head, a hose, and a supporting construction that holds garments and a stem head when idle. The main unit has large wheels for smooth maneuvering. 85 fl. oz of water heat up to 212 degrees in just one minute. A capacious water container allows a user to de-wrinkle and refresh more garments on a single fill and save some precious time. Telescoping poles that support a garment hanger enable height adjustment for convenient steaming while sitting or standing. There are four levels of steam intensity, which offer you more flexibility when working on silk, chiffon, cotton, linen or synthetics. Tank capacity: 85 fluid ounces. Four adjustable heights of a supporting pole. Four levels of steam intensity. Includes a crease attachment and a holding clip. Appropriate for both delicate and heavily-wrinkled fabrics. Rather light in weight and easy to roll from one room to another. Dual poles provide improved stability and reduce wobbling. Does not take much space when stored. The tank is non-transparent and there is no indicator to signal when the water amount is about to approach a critical point. PurSteam portable steamer can relieve you from the necessity to struggle with ironing. Four steam intensity modes allow you to steam both delicate and rough fabrics equally effectively. It is maneuverable, versatile and easy to put together. This portable steamer offers a unique mix of practicality and style. It consists of a sleek, elegant-looking main unit with oversized wheels, a steam head and a telescoping pole that supports a clothes hanger and clips. Some more words need to be said about a nozzle. It has an unconventional triangular shape, while most other devices have T-shaped nozzles. Steam outlets also repeat the shape of the head. In such a way it can cover a larger area in one move and at the same time penetrate in hard-to-reach spots and eliminate wrinkles as effectively as possible. Under close observation, the steam head reminds a soleplate of an iron. The garment hanger rotates 360 degrees to enable convenient steaming from all sides. You can lock the pole in one of the four height levels according to your preferences. The power switch is located on a base unit itself, so you can easily operate it with a slight push of a foot. After you have finished steaming, you can tilt the device and roll it on wheels in a suitcase-like style. This portable steamer needs only 3/4 of a minute to start steaming. An hour of powerful streaming will then freshen up your garments, bedding, curtains, drapery, table linen, pillows, upholstery, and other textiles. Additional attachments include a garment brush, a lint remover and a protection cap for delicates. An exclusive delta-shaped steam head with a metal soleplate eliminates wrinkles better than conventional nozzles. Easy to roll on large wheels. The pole is somewhat shorter than in other portable steamers. This portable steamer from Rowenta is rather versatile, stylish and efficient. Heating time is reduced to a minimum to enable faster and more efficient de-wrinkling than with other portable steamers. 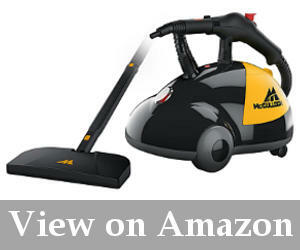 It is complete with a set of useful attachments and a supporting screen that makes steaming creases an easy job. This device is easy to operate, maneuver and store. 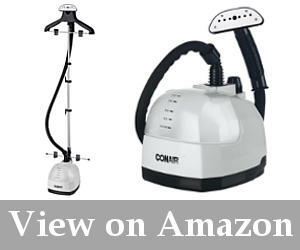 The Conair fabric steamer is the semi-professional device that can provide up to 90 minutes of efficient steaming. It is safe to be used even on delicate fabrics. The T-shaped steam nozzle is made of temperature-resistant plastic and equipped with an insulating handle to prevent skin burns. 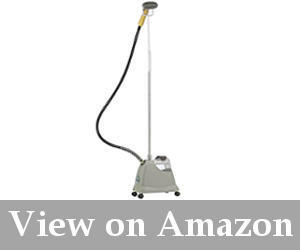 This portable steamer has low-profile wheels that allow it to roll easily on the bare floor and low-pile carpets. The power switch is located on the unit itself and can be easily controlled by a foot. There is also a steam pause function that discontinues steaming when needed for safety and energy-saving purposes. A hanger has two pairs of clips (top and bottom) designed to pull a garment tight for better steaming results. This is especially important when steaming pants or doing creases. Telescoping pole with a clothes hanger and clips. Heats up faster than most full-sized portable steamers. Easy to fill thanks to a detachable tank and a quick-release water valve. A rotating hanger allows you to treat both sides of a garment without having to change positions. A steam head and a hose stay cool to the touch. Provides impressive 80 minutes of ongoing steaming with an ability to put steam emission on hold. A steam head has only one nozzle without any other options. Hard to move on carpets because of small low-profile wheels. The Conair portable steamer might be a great choice for people who are looking for an effective way to eliminate wrinkles, other than ironing. This device is not as versatile as some other models, as it has only one non-detachable nozzle. However, it is sufficient to perform different kinds of steaming jobs around a house. If you like this brand and are looking for a travel-size good portable fabric steamer, you might be interested in Conair Turbo Extremesteam Handheld Fabric Steamer. This portable steamer from Jiffy is a multi-functional household device that can effectively replace ironing in most cases. In spite of its simple design, it is rather functional and serves its purpose quite well. This streamer features a 96-ounce removable water tank. It is made of transparent plastic, so you can check the amount of water at any moment to manage steaming time effectively. A full tank can provide up to 90 minutes of steaming. This model of Jiffy steamer is equipped with a metal head that can also act as iron to provide even better steaming results. Other attachments that come along include a pipe head, a garment brush, and a carpet attachment. So if you happen to be looking for the super portable carpet cleaner, this device might satisfy your needs. Comes with 4 attachments including a metal steaming head. Heats up in 2 minutes. Steaming unit with four castors. Steams for impressive 90 minutes. A see-through water reservoir allows you to control the water level. Hassle-free filling with a detachable water tank. A metal steaming head works like iron on pressed-in wrinkles. Also suitable for carpet steaming. Does not include a dedicated garment holder. A metal head might get heat up considerably when steam is on. You need to extremely careful with it. Jiffy J-2000M is a residential steamer that can perform a variety of jobs, including garment, upholstery, and carpet steaming. It is even suitable for professional use because its water tank is rather capacious and holds enough water to facilitate a 1.5-hour steaming session. This streamer is versatile, maneuverable and sturdy. It has a supporting pole with a steam head holder, but no garment hanger. If you plan on using a steamer every once in a while, there is no need to buy a bulky and expensive device. This travel-size portable steamer can come to the rescue when a full-size device or an iron is unavailable. 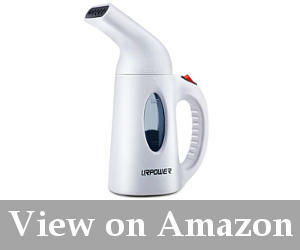 The URPOWER handheld steamer has a decent-sized water container, which is rather easy to fill. Once filled and turned on the device will start working in 2 minutes and is guaranteed to provide up to ten minutes of uninterrupted steaming. This streamer must be used strictly in the vertical position (only slight tilting is acceptable). The safety system shuts the device off automatically to prevent overheating and burning when too little water is left. The steamer is very easy to operate with one hand. The package also includes a textile travel bag for convenient storage. 10-minute steaming on one fill. Compact and portable; perfectly sized for travelling. Features an automatic shut-off system for user safety. Comes with a convenient travel bag. Not suitable for large steaming projects. This portable steamer from URPOWER becomes a decent alternative to a conventional full-size steamer when using the latter is impossible or inappropriate. It is perfect for traveling and/or keeping at hand in the office or at a clothes store. This steamer will be ineffective on large areas, such as curtains or an extensive collection of clothes. It is designed rather for occasional steaming and emergencies. This is another great option for travelling and steaming on the go. Its design is very similar to the URPOWER portable steamer. It has an incorporated water container with transparent sides that show the water content. An indicator marks the maximal and minimal levels to help you avoid mistakes and prevent a device from going out of order. Besides, a steamer will shut off automatically in case the amount of water reaches a critical level. This is very convenient and allows you to take care of your garments without worrying about overheating. The streamer has a single control button that is located on the handle for convenient operation. To start operating you pour some water in and place the switch in the “On” position. When it starts emitting steam (approximately in one minute) you will know that it is ready for use. Intuitive controls located on a handle for added convenience. Compact and convenient for traveling. Only effective for light and quick steaming. Short steaming time on one fill. If you need a quality portable steamer for clothes, this device might be a great solution. It is very small-sized and can easily fit into carry-on luggage. Also, it gets ready for use very quickly and can save you some precious minutes when you are short of time. The advantages of this steamer become disadvantages when it comes to removing heavy pressed-in wrinkles. There are several types of portable steamers and which one to choose depends mainly on your specific needs. What is a garment steamer to buy better? This is one of the most common questions people ask when shopping for a steamer. Here you can find the answers and useful tips on how to avoid mistakes when buying the best portable steamer. Steamers can clean, sanitize, kill pests, eliminate wrinkles, degrease and freshen up different surfaces. There are really not many devices that combine all these functions, so you need to choose which ones are of the top priority for you. If it is cleaning and sanitation than you should opt for a versatile steam machine or handheld steam cleaner for showers. 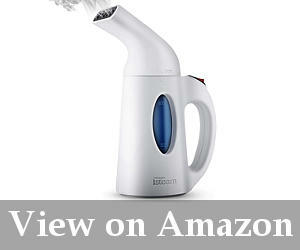 A handheld portable steamer is meant to be taken along on a business trip or a vacation. As a general rule, the larger the tank capacity, the longer the device can steam before needing a refill. Before buying a portable steamer with an extra-large tank, you should make sure it is really necessary. Only one hour of uninterrupted steaming can make you tired and needing a break anyway, so having to refill a tank in the meantime is not such a great of a hassle. We all hate waiting, so getting a fast-heating steamer seems like the right thing to do. Indeed, modern portable steamers can heat up a gallon of cold water to 212 degrees in less than one minute. This is a significant choice criterion that many customer (and, unfortunately, manufacturers) often overlook. If we speak about quality portable garment steamer, the first and foremost thing to consider is maneuverability. Assuming that you don’t have a dedicated room where you are going to do the steaming, there will definitely be some amount of moving around. Large wheels or casters will surely make it much more convenient and fatigue-free. You should also pay some extra attention to handles and water tanks. A handle should be ergonomic and properly insulated. Speaking about a water tank, it must be easy to fill and preferably transparent. As we know, a steamer is an electric device that uses water to operate, so it can be potentially hazardous. Buying cheap steam cleaners is a poor decision because they might have some serious safety issues. Always make sure that a portable steamer is perfectly insulated and that the joints that connect a water container to a heating unit are intact and leak-proof. Also, make sure you know how to steam clothes with a steamer properly and refer to a user manual if needed. Steaming is probably the easiest and the most effective ways to tackle a variety of housekeeping tasks. Portable steamers have already become indispensable helpers for thousands of families. There are many types of portable steamers with different functions and ranges of application. Finding the right one might seem a difficult job, but once you’ve learn more about steamers, everything will make sense. We have reviewed several types of portable steamers, each of which might be just the right one for you. Once you understand your needs, it will be easy to choose a device that will suit them in the better way.